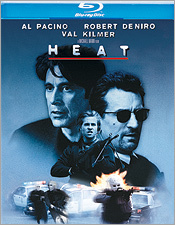 Heat is perhaps the ultimate guy flick. Directed by Michael Mann, the film tells the story of two not-so-very-different men. One, an LAPD homicide detective named Vincent Hanna (Al Pacino), is so consumed by his work that he’s failing his third marriage. Hanna prowls the streets of L.A. like a wolf, stalking those who would do wrong, while his personal life falls into ruin. The other, a professional criminal named McCauley (Robert De Niro), is simply doing what he knows best – armed robbery. He also lives a lonely existence, making no personal connections that he couldn’t walk out on at a moment’s notice. McCauley and his crew are after one last score – a bank heist that could land them more than $12 million. As these two hardened pros go about their business, they gradually become aware of one another – predator and prey – and each begins to gain a certain respect for the other. But both also know that they’re on a collision course: In the end, only one will be left standing. As if the Pacino vs. De Niro match-up weren’t cool enough here, Mann has surrounded these two with an absolute dream cast of fine supporting players, including Val Kilmer, Jon Voight, Tom Sizemore, Ted Levine, Hank Azaria, Ashley Judd and Natalie Portman. Each character seems well-rounded and fully-dimensional. The plot itself is based on years of research by Mann into actual criminals and police work, making it both plausible and believable. And when the action heats up, it’s first rate and entirely justified by the story. Warner’s Blu-ray version delivers Heat with a new HD transfer supervised by Mann himself, and the film thankfully looks better than I’ve ever seen it on disc before. Contrast is excellent, and while the color palate is cool and muted by design, it’s quite appropriate to the film. Image detail is nice on the whole, and though the film does occasionally look a little soft, this is an artifact of the anamorphic camera process used, rather than any transfer or compression issues. Thankfully, grain reduction is minimal and the overall transfer, while not reference quality, more than delivers the goods. On the audio side, the Blu-ray’s Dolby TrueHD delivers as well, with clear dialogue and satisfying staging. The surround play is lively in action scenes and otherwise highly atmospheric, though it’s always smooth and natural sounding. This mix doesn’t quite have the oomph of more recent surround tracks for action films, but again it’s entirely appropriate to THIS particular film, and fans should be plenty happy with it. I should note here that there was quite a bit of buzz when this title was first announced, as Warner’s press release indicated that the disc would present a new cut of Heat prepared by Mann himself – one with as much as 2 minutes of footage excised from the theatrical running time. You’ll be pleased to know that this was inaccurate. The film’s Blu-ray running time is essentially the same. Two tiny edits have been made, removing a couple quick lines of dialogue, to smooth the editing flow. The first cut happens around an hour in (1:05 to be specific) and removes a tiny portion of Justine’s speech (the words “You sift through the detritus...” are gone). The second cut happens about 13 minutes later (at about 1:18), with the removal of a mumbled word by Hank Azaria and Hanna’s odd “Ferocious, aren’t I?” line. Both bits of dialogue felt awkward in the original cut to begin with (Who uses the word ‘detritus’ in daily conversation?) and, frankly, the scenes are better without them. The second cut especially is welcome, as now you simply see the reaction on Azaria’s face, which is far more effective in conveying his emotions. And those are the only changes. Let’s put it this way: I’m generally a stickler about keeping alternate versions of my favorite films, but I don’t miss the cut lines here in the slightest. I sincerely doubt most people will even notice the difference. Extras-wise, fans will be happy to know that the Blu-ray carries over everything from the previous 2-disc DVD special edition, including Mann’s excellent audio commentary, all the deleted scenes, the 3 featurettes (The Making of Heat, Pacino and De Niro: The Conversation and Return to the Scene of the Crime) and the trailers. If you plan to upgrade to the Blu-ray, you can safely sell your DVD and be done with it. Heat is just a great film, and one that I can’t recommend more highly. While this disc isn’t the most comprehensive special edition you’d hope for, the extras are plenty good enough, and the film certainly looks and sounds great. If you’re a fan and you can get a good price, don’t hesitate to upgrade from DVD. And if you’ve never seen Heat before, the film is definitely best experienced in high-definition, so Blu-ray’s the only real way to go.